This week I will present one more group of Mojíca masks from my collection. The first Mojíca has a modern appearance that again reminds one of the practice of organizing the human face into planes, as one sees in Cubism. I am referring to the carved arcs over the eyes and the severe shaping of the nose. I bought this from the Mano Mágica Gallery in the city of Oaxaca in March, 2001. It was originally collected in the field by Jaled Muyaes and Estela Ogazón. We see again these little teeth. Last week I provided an introduction to the Mojíca masks found in Veracruz. This week I will show further examples of these female clown masks. I purchased the first of these Mojíca masks on EBay™ in 2005. It had been repainted badly and the most recent paint was separating from an earlier coat, but I liked the quality of the carving. I was able to gently flake off the loose paint. This then became one of my favorite masks, because the sculpting of the face is so dynamic. This complexity of facial planes is only found on some of these masks, perhaps all by the same carver? I wish I knew more. 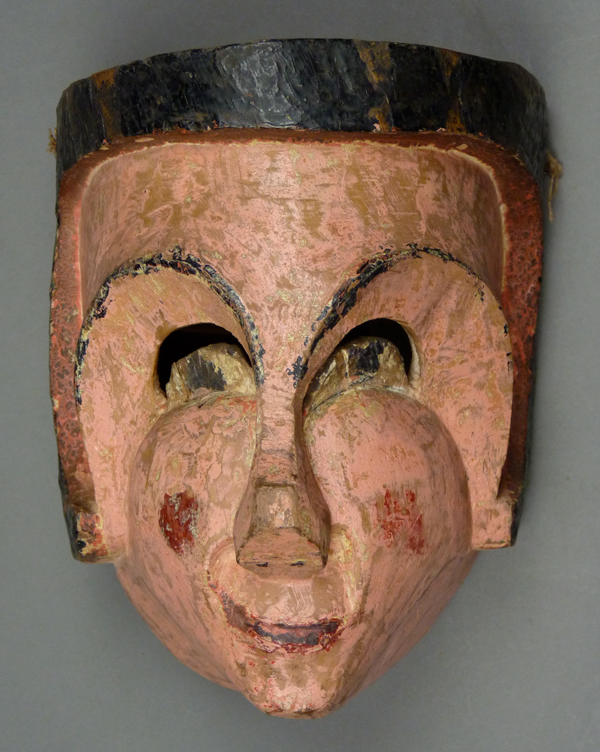 Having introduced you to Mojíca masks in my discussion of the Urmston Collection, I decided to do further posts on those masks, drawing on my collection (none of the masks in today’s post are for sale). I will start with a pair of Mojíca masks that I bought from René Bustamante in 1993. They were said to be from Bolaños, Veracruz, a place that I have been unable to locate. Based on their style, I feel confident that they are from Veracruz. According to René, the first represents Hernán Cortez and the second is his consort, Malinche. 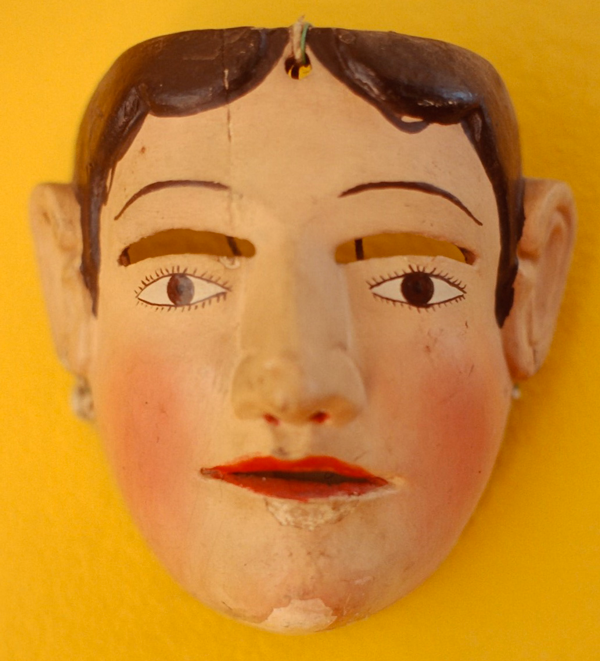 Here is the male mask—Hernán Cortéz. 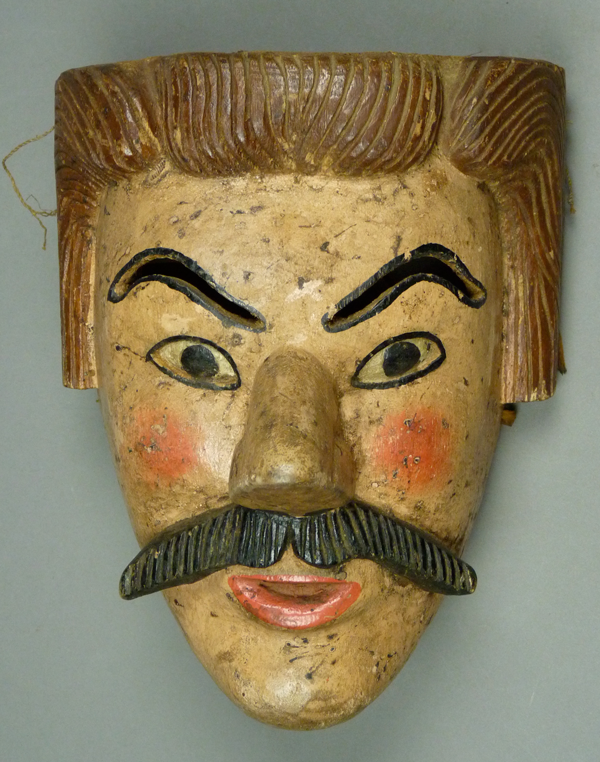 This mask has a number of notable features, including the hairline in high relief, the vision slits within the eyebrows, and the elegant mustache. 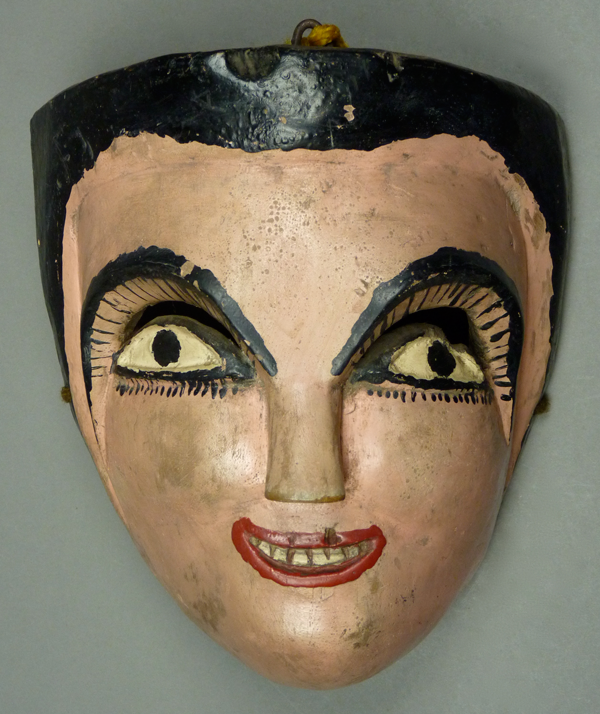 This will be the final post that focuses on the Mexican masks in the James and Jane Urmston collection. Today’s many masks, from various Mexican states and dances, were chosen because they are genuine, high quality, danced, and almost all were still for sale (a few interesting masks that are already sold will find a place in later posts). I remind you that the Urmstons have been selling their collection, mask by mask, so I can not guarantee that a particular mask will remain unsold by the time it appears on this site. I have no commercial interest in these sales, rather I am simply relishing the opportunity to share these masks with interested collectors, whether to purchase or simply to learn from. You may contact the Urmstons at urmston@verizon.net. I will begin with two Female Huehue or Tejonero masks from the Sierra de Puebla; both are well-carved and highly attractive. Based on design details such as the shaping of the ears and face, I believe that this first mask was carved by Benito Juárez Figueroa.